This is my second box I have made from Sharon Johnson's tutorial. This box is made to fit a jar candle or any item that is about 3 inches tall. I followed Sharon's easy tutorial and the box went together very nicely. I used the Scor-Pal to make this box and I was very please. I also have the Scor-it which I love. But I wanted to try the Scor-Pal as I know many of you use it and I also have it for sale this week. It worked great! 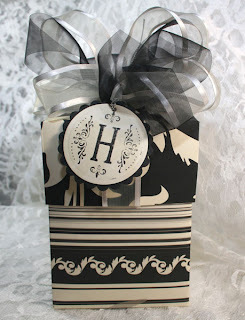 I used my JustRite Monogram stamper for the tag. My idea for making this box is to give it to my sister-in-law for her birthday in December. She loves black and I think she will like this box. I think I will make her a candle to go in it. I will post that when I get it made. Sharon, these boxes sure are fun to make and thanks again for taking the time to show us how to do them. Joan - love your box - and your bow is truly stunning. Thanks for sharing.